Apple's dominance of the tablet market has gradually deteriorated over the years and with slates like the Samsung Galaxy Tab S2 it's no wonder. With a 9.7-inch screen, a slim and light build and lots of power all packed into a premium shell it's almost an iPad Air 2 running Android. Yet at around £320 it undercuts Apple's flagship slate, in fact when it comes to price you're in iPad mini 4 territory here. On the other hand, as an upgrade to the Samsung Galaxy Tab S it's less impressive and while the Galaxy Tab S2 ticks many of the same boxes as the iPad Air 2, it doesn't do it with as much flair. The Samsung Galaxy Tab S2 has some similarities with the iPad Air 2 (there's only so much you can do when designing a tablet), but in some ways it actually outdoes it, as at 5.6mm thick and 389g it's both slimmer and lighter. That's quite an achievement and means you can easily hold it in one hand or throw it in a bag and forget about it. Back in Android land the Sony Xperia Z4 Tablet is almost as slim and just as light, but few other slates can compete with it. The actual design is slightly less inspiring. The Tab S2 has a metal frame and a plastic back, which could almost pass for metal, but is a distinctly lower end material. The whole thing, metal and plastic both, is also a little slippery and, well, plain. You could call it understated if you were feeling kind, but whatever you call it the Samsung Galaxy Tab S2 won't elicit the same impressed reactions as the iPad Air 2 or indeed the Samsung Galaxy S6. Still, it's an improvement on the all-plastic Samsung Galaxy Tab S.
Samsung does screens like nobody's business and the Galaxy Tab S2 is no exception, with a bright and vivid Super AMOLED display, just like you'll find on its smartphones. That's also what you'll find on the original Galaxy Tab S, but oddly Samsung has actually lowered the resolution for the new model, bringing it to an iPad Air 2-matching 1536 x 2048. It's a shame that it's a step down, but it's still plenty sharp enough and a real joy to use. The company has also changed the aspect ratio from 16:9 to 4:3, clearly in a bid to compete more directly with Apple's slates. The change makes it worse for watching movies, but better for web browsing. If it seems like we're making so many comparisons with the iPad, you'll find it hard not to when you pick this up - and most of the changes from Samsung seem to have been designed to fight toe-to-toe with Apple's tablet. Away from the screen, there's a fingerprint scanner packed into the Galaxy Tab S2, making it speedy to unlock. It mostly works well and as you can register up to four fingers you're not stuck using the same digit every time, but it failed to recognise the print about one in four times and on those occasions just typing in a PIN would have been faster. With an octa-core processor and 3GB of RAM the Samsung Galaxy Tab S2 is a clear flagship and it performs like one, though it's not quite as fast as the Samsung Galaxy S6 or the monstrous iPad Pro. In practice you won't notice. Everything feels smooth under the finger and it even copes well with high-end games. There's an occasional pause when swiping across the home screen, but that's likely the TouchWiz effect rather than a lack of grunt. Battery life is a bit more of a worry, as if you do plan to use it for a lot of gaming or video you'll see it come crashing down in a matter of hours. With moderate mixed use you'll get a day or more out of it, but it won't see you through a full Star Wars marathon, so choose your starting trilogy carefully. The camera is what it is - an okay 8MP snapper strapped to something that's far too big to ever use as a camera. In overcast autumn days it struggled to take any shots which weren't a bit dark, but get the light right and it's not awful. The arguably more useful front-facing camera is just a 2.1MP one, which again struggles unless the lighting is bright and consistent. The Galaxy Tab S2 runs Android Lollipop overlaid with TouchWiz. Samsung's modifications have never been the best, but there are some decent features here. Flipboard is baked right in for one, so a swipe to the leftmost screen will give you easy access to news and entertainment stories. Samsung has also taken advantage of the large 9.7-inch display to offer a split screen mode for easier multi-tasking - the tablet is powerful enough to handle this smoothly, but the screen is just a little too small for it to be entirely comfortable. 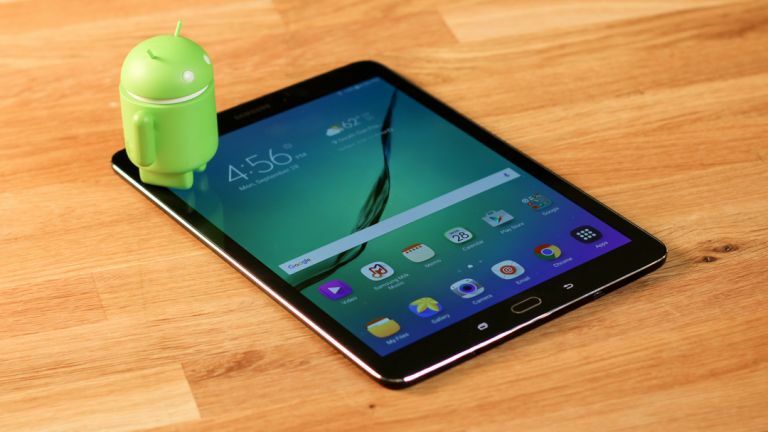 Is the Samsung Galaxy Tab S2 the slate to unseat Apple? Not quite, but in many ways it feels like an Android iPad. It's a joy to use thanks to a thin and light design, a big and bright screen and plenty of power, which are the most important things really. Well, those and battery life, which isn't quite as good as it could be, but there's still enough juice here to see you through an average day of use with ease. All that and the Samsung Galaxy Tab S2 won't cost you any more than an iPad mini 4. It's not as beautiful to behold as Apple's tablets and with a not fully premium design it doesn't feel quite as high-end, but if you're after an Android slate with a great screen then this is right up there.